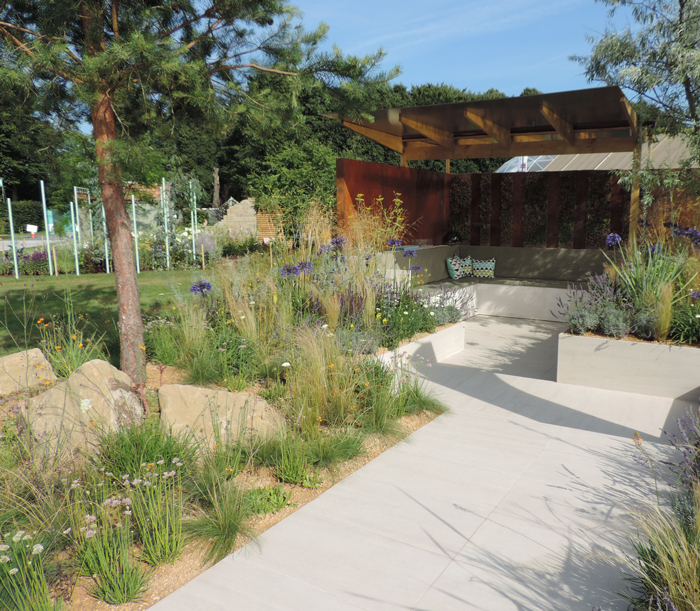 From take-home advice to ideas on greening up grey spaces, the 19th RHS Tatton Park has something for everyone, writes Sandy Felton. 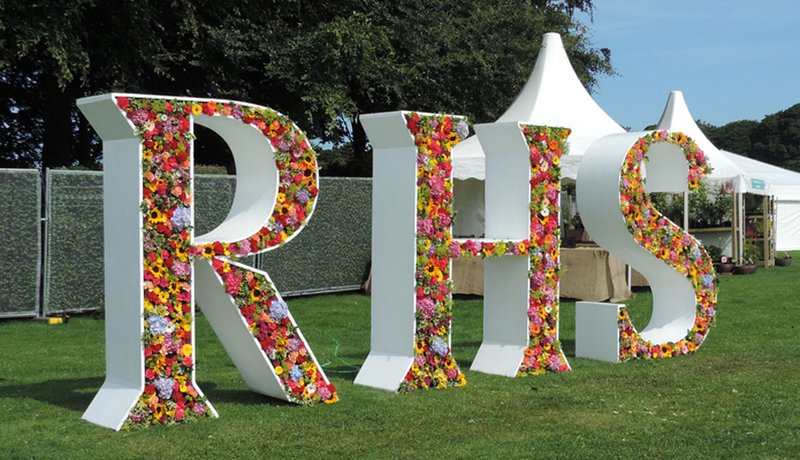 It was another scorchio press day at the RHS Tatton Park Flower Show (9th to 23rd July 2017) with the sun bringing out the very best of a wide variety of urban gardens. 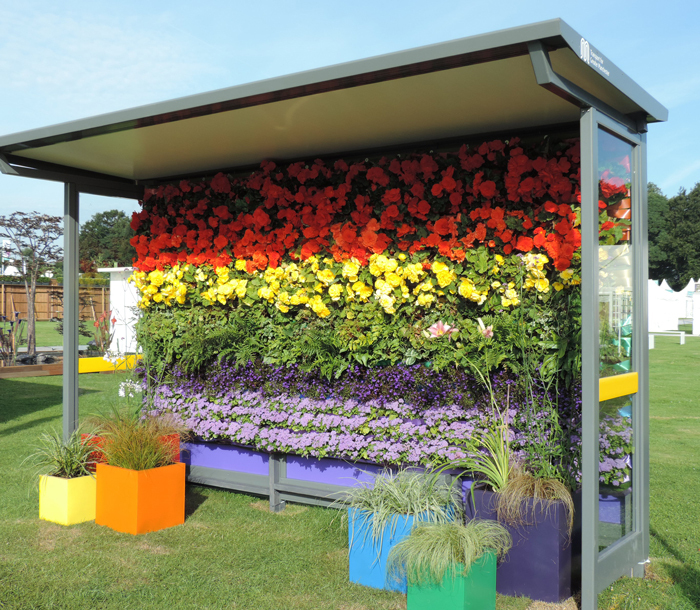 From planted-up bus stops to future spaces and a flood-relief garden, the 2017 show is packed with take-home advice and planting ideas to suit every taste. It was no surprise to me that this garden won Best in Show. Not only did it look superb, it was packed with features that every one of us could utilize in our own gardens. Excess surface water is becoming a problem, especially as so many houses now have hard surface front gardens. ‘Slow the Flow’ demonstrates techniques for catching and storing rainwater and then either preventing it entering, or slowly releasing it into the sewer system. A garden room demonstrating the entrance to a house contains a green roof, there are concrete beam walkways, stone catchment gullies, gabion walling and a turfstone driveway. The design works well to illustrate some of the ways we can deal effectively with excess surface water while at the same time creating a green and attractive garden. John explains that you can plant whatever you want in the garden as long as you have the hard landscaping right so visitors will recognise many plants from their own gardens such as Geranium ‘Azure Red’, Hosta ‘Halcyon’ and Betula Nigra. 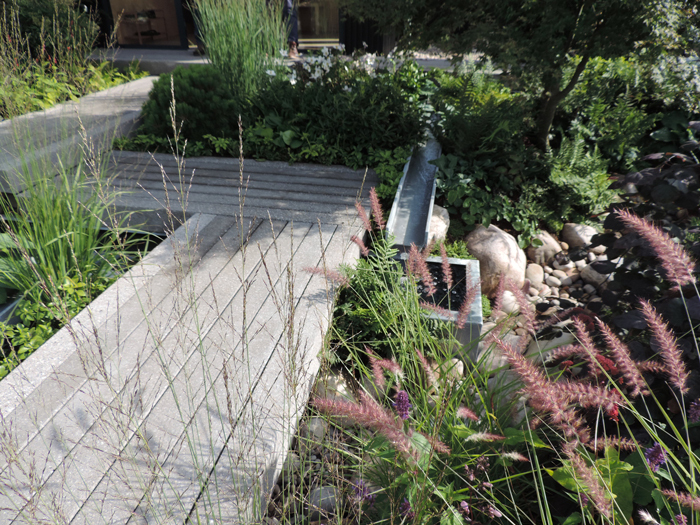 RHS Tatton always has plenty of gardens that visitors can instantly relate to, enabling them to take away lots of ideas for their own gardens. ‘For the Love of It‘ (Silver-Gilt) designed by Pip Probert is one such garden. 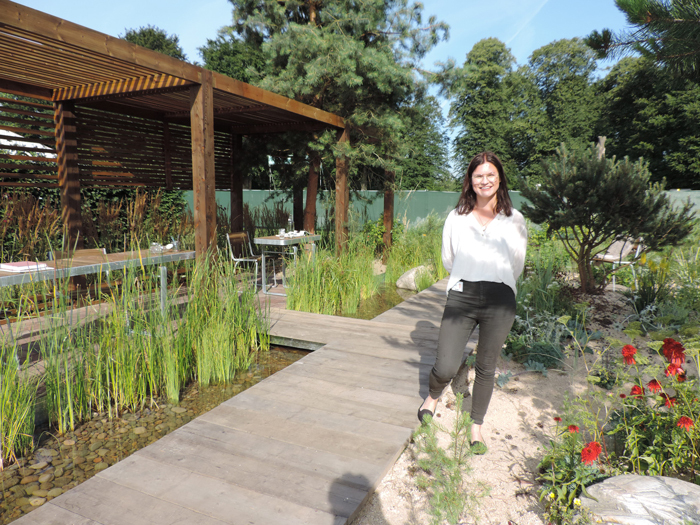 Pip explains that she is always keen to design a show garden that easily strikes a chord with visitors and her design for this year’s show is no different. Creating a series of garden rooms, the design is intended for families to encourage them to get outside and use their gardens. She cleverly incorporates a patio dining area, screened by trees and using the calming effects of a living green wall; a quiet seating corner; a lawn for children to play on and colourful planting. 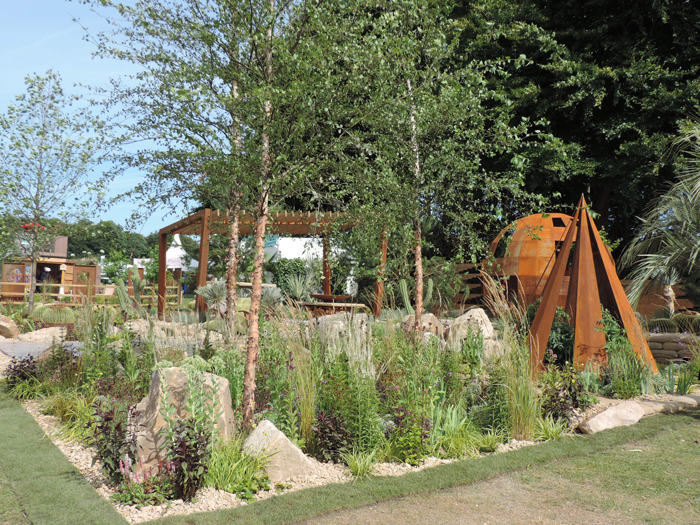 ‘Facing Fear, Finding Hope: in support of Crohn’s and Colitis UK‘ (Gold) designed by Peter Hulland and Rory Tompsett working with Denise Shields is a moving garden demonstrating the emotional journey through illness and remission of sufferers of this condition. A steel pergola, angular path and bubbling pool symbolize confusion while steps draw visitors down into Finding Hope, a bright sunken area reflecting the transition towards better health. A beautiful design and one perfectly encapsulating the turbulent nature of the condition. 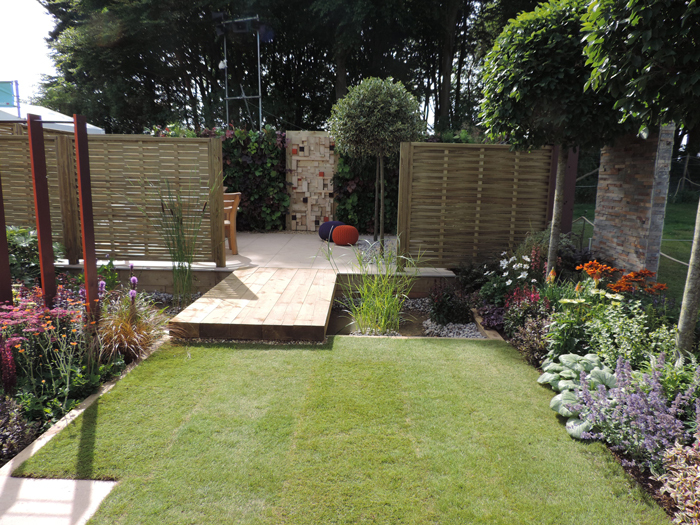 The Best Back to Back Garden goes to the ‘Macmillan Legacy Garden‘ (Gold) (pictured above) designed by Lara Behr. 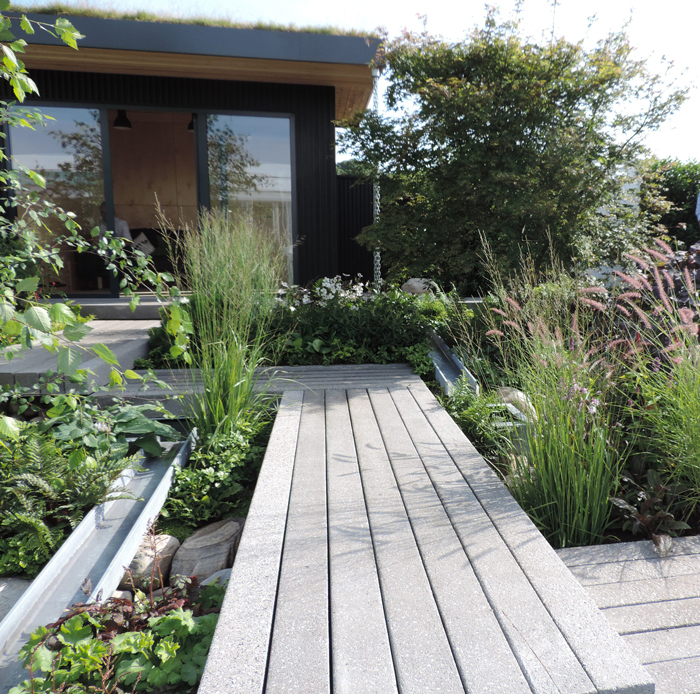 Always a favourite category with visitors to RHS Tatton, the Back to Back gardens offer design concepts that we can all easily adopt. 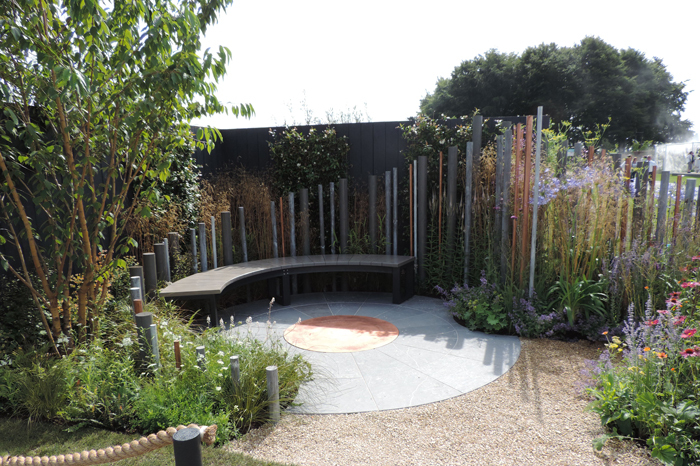 This circular garden, enclosed by copper poles, is a reflective and gentle space with planting carefully chosen for colour, scent and texture. Good news to know that after the show the garden will be replanted at the Chesterfield Royal Hospital. Complete with around 300 plants it will be moved to an outside space surrounding the hospital’s one-of-a-kind cancer centre. 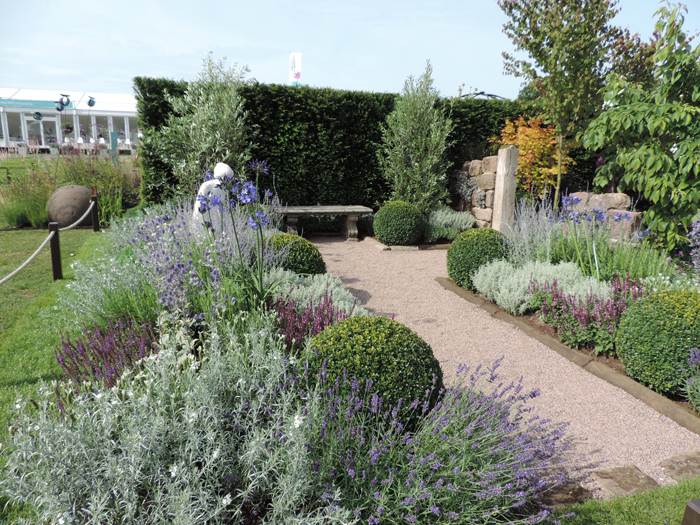 Cheshire’s Gardens of Distinction was formed to draw together the best of the county’s gardens, celebrating the richness and diversity of the region’s horticulture. 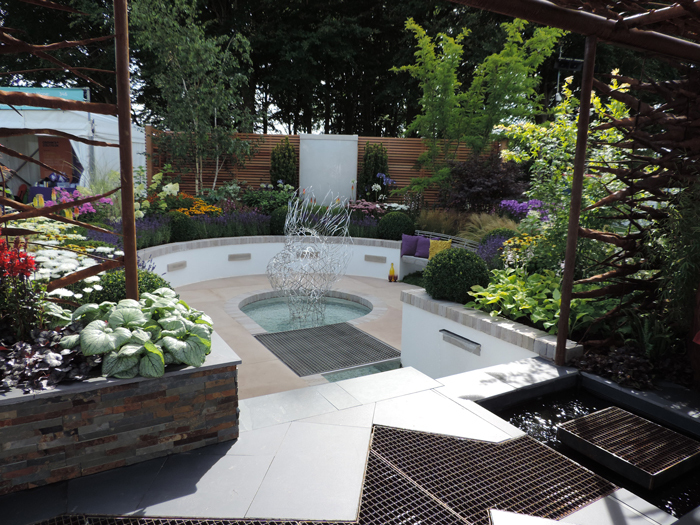 Their three gardens in the Back to Back category were awarded Silver-Gilt – Arley Hall & Gardens, Bluebell Cottage Gardens and Cholmondeley Castle Gardens using the Feel Good campaign as their focal point. Cholmondeley Castle Gardens – Spinning the Silver Threat – designed by Barry Grain was particularly attractive. Highlighting the diversity of Cholmondeley Castle Gardens, this double back to back displays two very different spaces separated by a sandstone wall. One of my favourites in this category. (pictured above). Best Future Spaces Garden went to Cactus Direct 2101 (Gold) designed by Michael John McGarr, as did the Best Construction Award – Warnes McGarr & Co. (pictured above) This garden was certainly attracting a lot of attention on press day with its futuristic design demonstrating how our gardens will evolve due to climate change. With many native plant species extinct our gardens are likely to resemble the landscapes of Southern California or Mexico and the garden cleverly demonstrates how we can utilize drought-resistant plants as well as engaging visitors on the impacts of climate change. A worthy Gold and winner – thought provoking and stunning. The Floral Marquee was, as usual, awash with all kinds of exotic and colourful plants, basically to die for! The RHS Master Grower exhibit by W.S.Warmenhoven was stunning while Holden Clough Nursery (Gold) with their exhibit of mixed summer perennials was awarded Best Exhibit. The RHS Young Designer gardens are one of my favourites at RHS Tatton and congratulations go to Ula Maria(pictured above) for her delightful Studio Unwired. (Gold). Gold also went to Jake Curley for his Business and Pleasure design and Silver-Gilt to Anca Panait for Prospect & Refuge. New for this year is the Bus Stop Boulevard with its highly decorated bus shelters. Thought this was great fun with some really imaginative ways of brightening up the shelters with plants and art. Pictured above is the Pride of Manchester bus stop, supporting pollinators, people and the LGBT+ community. Inspired by the groundbreaking bus stops recently constructed near Piccadilly Gardens with waterproof solar charging panels sited to the roof and USB ports for people to connect phone chargers! I always come back from RHS Tatton with my head packed with ideas and this year is no exception. Well done to everyone for making this Show such an enjoyable event to visit. Photo credits: All photographs are ©Reckless Gardener 2017.